Dread Skeeter poses on the cover of the coloring book, a backpack-mounted pesticide spray gun in his hand and muscles bulging under his T-shirt. A few pages in, outlines of young kids playing football accompanies a caption: "Backyards are better without biting bugs." 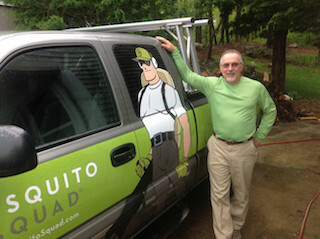 The coloring book -- with its superhero-like mascot -- are given to kids for free by Mosquito Squad, one of many private pest control companies that has recently seen a boom in business. A mild winter and spring around much of the country has brought out bugs in record numbers. Widespread fear of West Nile, Lyme and other diseases carried by those insects is driving people to seek professional services, according to Mosquito Squad's founder. "I also think simply being able to go out and enjoy cookouts and pools without being irritated with bites all the time is a factor," said Boyd Honeycutt, who launched the company in 2005. "For folks with small children, there's also the concern about bites becoming infected from scratching with hands that might be dirty." But the growing popularity of Dread Skeeter is increasingly worrisome to environmental experts and government officials who oppose the widespread use of pesticides -- particularly, they say, due to health risks for kids, from asthma attacks to long-term learning and reproductive problems. "And they're advertising to children, who have no way of discerning the health effects or dangers of pesticide use. Giving young children these coloring books is not too different than advertising tobacco to them," said Nancy Alderman, president of the nonprofit Environment and Human Health, Inc. Alderman expressed even greater concern after seeing pictures of a costumed Dread Skeeter with kids in a parade and on a playground. "It's unbelievable." The purpose of the coloring books and community events, according to Honeycutt, is to educate kids about the dangers of insect-borne diseases and how to protect themselves. "We are trying to help kids," he said. "We're in business at the same time. We create a lot of jobs and help the economy as well." Arthur Rodrigues owns one of the company's more than 100 franchises, a figure that's risen from just 17 in February 2009, Honeycutt said. After using the pesticide treatment so he could host his daughter's wedding in his backyard, Rodrigues started the Fall River, Mass., franchise in April. He now sprays about 60 resident and commercial properties a week -- an effort that is ancillary and uncoordinated with the state's own services. "We're getting a good response. People are happy," said Rodrigues, adding that he guarantees an 85 to 90 percent reduction in mosquitoes based on information provided by the chemicals' manufacturers. Rodrigues noted that a pregnant customer recently opted for a natural, garlic-based spray even thought it is less effective. Still, his most popular service is a pesticide barrier sprayed on foliage around homes, or on a lawn if there aren't enough bushes and plants to treat. He said his team avoids spraying chemicals on any flowers that are in bloom so that bees will be protected. "The product dries in about half an hour," Rodrigues said. "After that, it's safe for pets and children to use the yard as they normally would." Meanwhile, the product is supposed to continue killing mosquitoes and ticks for 21 days. "Anything that lands on [the leaves, brush or grass] will meet its demise," Rodrigues said. He sells a summer package that includes a reapplication every three weeks. Honeycutt would not share the recipe of his company's pest-killing blend, but did name two of the ingredients: bifenthrin and cyfluthrin. The two pesticides are synthetic forms of molecules created naturally by chrysanthemums, a point the company spotlights in its coloring book. Both are also registered with the U.S. Environmental Protection Agency. However, the agency labels bifenthrin as a possible human carcinogen and is currently reviewing both chemicals due to suspicions that they could cause allergic reactions and disrupt the endocrine system, said John Wargo, an environmental health professor at Yale University. The latter is of particular concern to Wargo. Chemicals that mimic human hormones can scramble the body's natural signals, potentially leading to developmental disorders, sexual problems and obesity, among other health issues, he said. Recent research suggests harmful effects could even result from tiny doses. "This is especially worrisome for pregnant women and young children during rapid periods of growth and development," said Wargo, highlighting the danger of the persistence and reapplication of the pesticides in people's yards. The undisclosed ingredients that are added to help Mosquito Squad's pesticides stick to foliage could also be harmful to people's nervous and respiratory systems, Wargo said. What's more, each chemical doesn't necessarily act alone; the pair of pesticides could interact to cause additional harm. And exposures accumulate: The average person is exposed to multiple pesticides every day via food residues, indoor pesticide products and outdoor products that end up getting tracked inside, he said. Critics also question whether pesticide sprays actually succeed in killing their intended targets, and whether they protect people from contracting bug-borne diseases. Biologists at Cornell University point out that targeting mosquitoes with sprays only results in "temporary control" and "should only be considered as a last resort." "I think at best they're somewhat effective," said Lee Corte-Real, director of crop and pest services for the Massachusetts Department of Agriculture, referring to Mosquito Squad's spray. "Eighty to 90 percent is being very, very generous. Mosquitoes are notorious for not observing property lines." One Mosquito Squad service in particular, an automatic pesticide misting system, raises red flags for Corte-Real. "Those are accidents waiting to happen," he said. "There isn't a person to see if a kid or a dog is walking by. It just goes off when the timer says so." But Mosquito Squad's Honeycutt said that customers who purchase the system are told to take precautions, especially in regards to when to set the timer. In response to criticisms about the ingredients in pesticides, he said, "We never use the word 'safe.' We provide the labels and Material Safety Data Sheets to anyone who uses our products." Some decide to keep any potential risk from pesticides at bay, such as government officials in Washington, D.C, where a local Mosquito Squad franchise currently serves thousands of customers a month. The officials opt for nontoxic strategies, such as targeting mosquito breeding grounds and enlisting residents to help protect themselves and their neighbors. Maria Hille, program manager in animal disease control with the D.C. Department of Health, suggests it is safer and more effective to educate residents. Among her recommendations: eliminate mosquito breeding sites by getting rid of old tires and flipping over plastic wading pools, as well as make sure your skin is not exposed for hungry bugs. "Spraying is not an option in the District of Columbia for health reasons," Hille said.